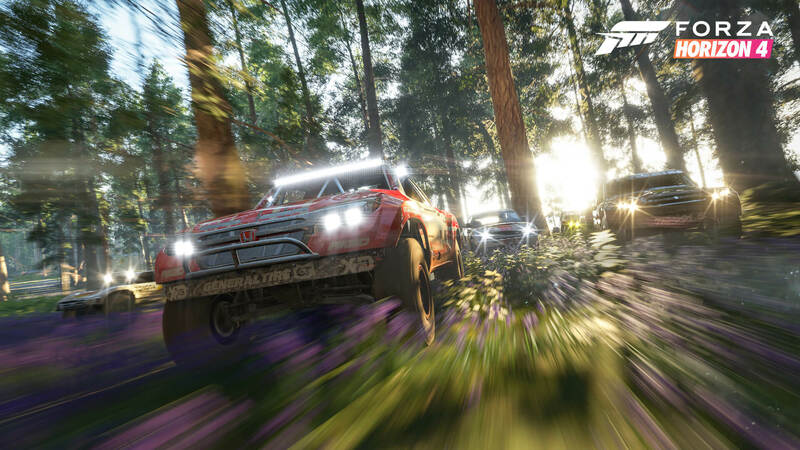 Seasons were the headlining feature showcased in Forza Horizon 4 at Microsoft’s E3 2018 Briefing. They change everything in the game. From the landscapes and weather conditions to the overall look and feel of the game, seasons will bring new life to Forza Horizon 4 like no other entry before it in the acclaimed open-world racing series. From the asphalt and dirt roads to grassy fields, hills and historic cities. This is Britain, brought to life in spectacular native 4K and HDR with realistic seasons that change every week in a beautiful, shared open-world. Developed by Playground Games, the UK-based studio recently acquired by Microsoft, Forza Horizon 4 features the biggest automotive playset of any recent open-world racer, with more than 450 cars available to collect as you explore, race and rise the ranks to become a Horizon Superstar. It all starts with the cover stars of Forza Horizon 4. 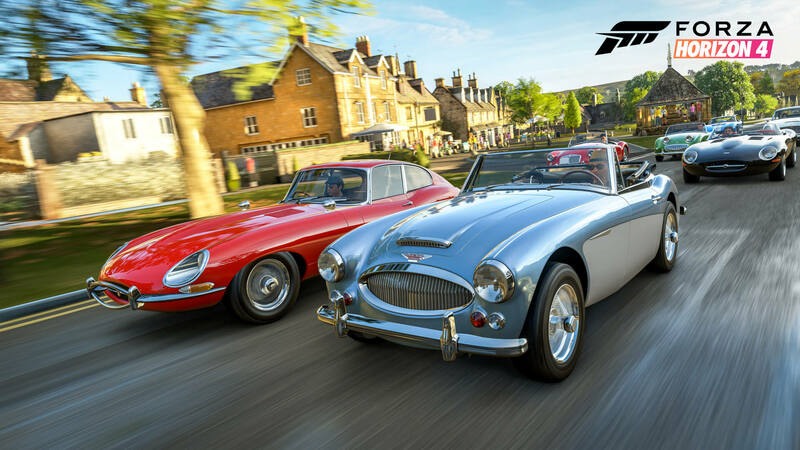 The Forza franchise has always featured industry-leading supercars and Forza Horizon 4’s British cover stars are no exception to this rule, with the McLaren Senna and the 1997 Land Rover Defender 90 adorning the cover art of Forza Horizon 4. 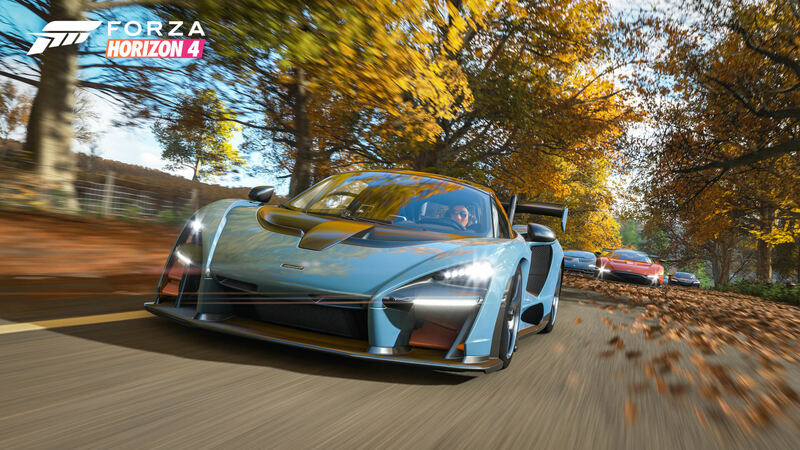 The all-new McLaren Senna is the headlining cover car of Forza Horizon 4. Designed to reimagine open-world driving with new features and gameplay experiences, Forza Horizon 4 will deliver historic locations in Britain with more choice and customization than ever. Dynamic seasons change gameplay as players unlock new events and routes, impacting driving conditions and transforming open-world exploration with dry, wet, muddy, snowy and icy conditions. From clear skies to thunderstorms and blizzards. All brought to life in a shared landscape where everyone experiences changes in time-of-day, weather conditions and seasons together. As part of IGN's exclusive Forza Horizon 4 coverage this month, several new features and details were revealed. 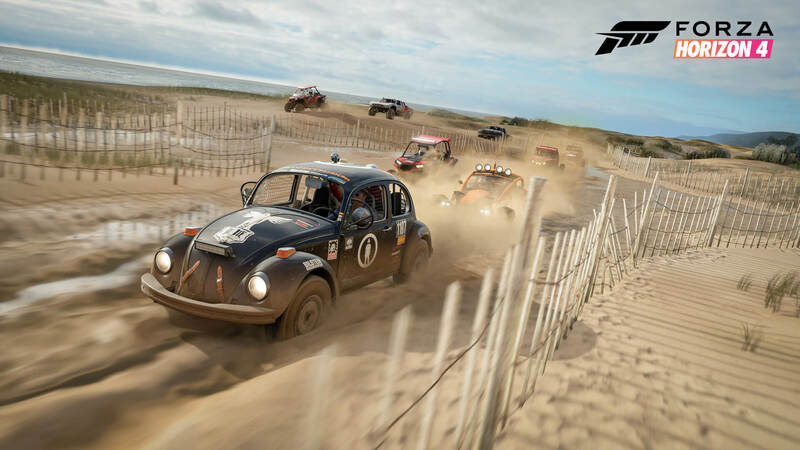 IGN had the opportunity to check out Forza Horizon 4 at Playground Games in the UK ahead of E3 this past weekend, and one of the headlining features discussed were seasons. These seasons change the overall look, feel and vibe of Forza Horizon 4’s Britain. In Summer, the sun casts its light over the villages, towns and countryside with fields that extend for miles full of the lushest, greenest grass with their characteristic golden colour and flourished deciduous trees, blooming flowers, crops and livestock. Then Autumn sees the world become swept in browns and yellows with leaves covering the asphalt as trees begin to fade whilst famers have harvested up their crops – all baled up and ready to go. Showcase events are back in Forza Horizon 4 featuring hovercrafts and stunt bikes! Winter introduces Blizzard Mountain-style conditions with heavy snowfall, icy conditions and dim lighting as fields become fallow and ice lakes form in the rivers and lakes. Spring adds a damp and fresh look to the overall world as blossoms begin to budge in hedgerows and trees with bluebells and snowdrops popping up in the woods as a mist hangs over the valleys before later burning off – all sporadically accompanied by April showers that come and go. It’s truly four different worlds brought to life as one. Even the sheep are shorn, and there’s also other wildlife too, including deer, rabbits, crows, grasshoppers and chickens – but you obviously can’t hit into them. Foliage naturally played a significant role for the team, and each tree in Autumn changes colour uniquely – it’s all dependent on its health, the soil and moisture on the ground. Some trees will hold onto their greens for longer as others become brown and golden as the rest drop all their leaves entirely. 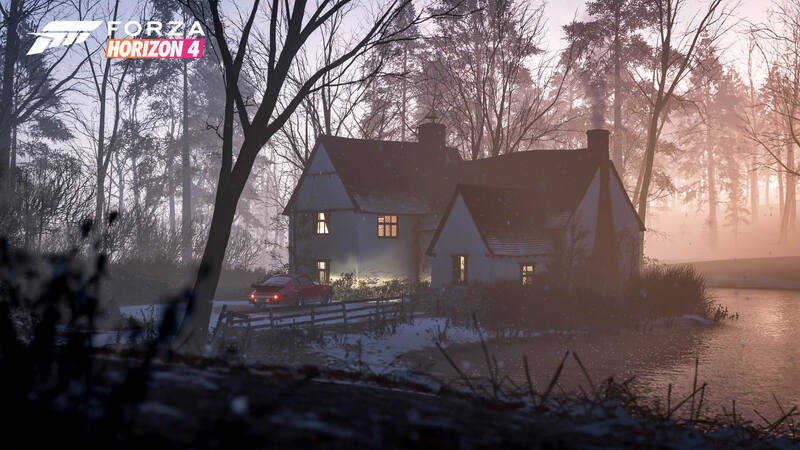 Obviously, the dynamic sky and lighting conditions also play a huge role in bringing seasons to life in Forza Horizon 4 and there’s even seasonal overrides for precipitation chances, as well as other conditions such as wind, thunderstorms and snow. Classic sports cars driving through historic Britain on a beautiful Summer afternoon. These seasons are also synchronized for all players in the Forza Horizon 4 world. Time conditions, weather conditions and seasons are all matched for everyone with seasons lasting a total of one week before they transition and move onto the next one. If it rains, everyone sees it together, if there’s a rainbow, sunset or thunderstorm, then everyone sees it together. That shared experience in a world dominated by social media makes the new live experience in Forza Horizon 4 an idea that’s very current and relevant. Forza Horizon 4 also isn’t an always-online game. As much as this is a shared open-world experience, with the click of a button, you can experience the entire game with Drivatars in single-player the same way you did in Forza Horizon 3. The seasons will still change weekly too, based on the system clock of your Xbox One console or PC. Fan-favourite features such as Photo Mode, Rewind and of course, the ability to pause the game are all present – and you can’t be griefed by strangers as they’ll be ghosted if you aren’t friends with them or partaking in a race activity together. Create your own custom race events and team-up with players from across the world. There’s also a quick chat emote-style system that allows players to communicate via the d-pad to others, which is great for both accessibility, inclusiveness and of course, overcoming the language barrier – and you can also form conveys with each other to take part in every race and activity thanks to six-player campaign co-op, an increase over the four-player co-op in Forza Horizon 3. Racers will forge their page to becoming a Horizon Superstar in the all-new open-ended campaign as two of the most fan-requested features make their debut in the Forza Horizon series. The first of these is a brand-new ‘Route Creator’ that allows players to design and share their own custom race routes anywhere within the open-world. The second is a dedicated 60FPS mode, exclusively for those on Xbox One X, and of course, Windows 10 PCs. This mode will compliment the native 4K HDR experience that’s already available in Forza Horizon 3. Inspect cars up closely in Forzavista at your own house in Forza Horizon 4. 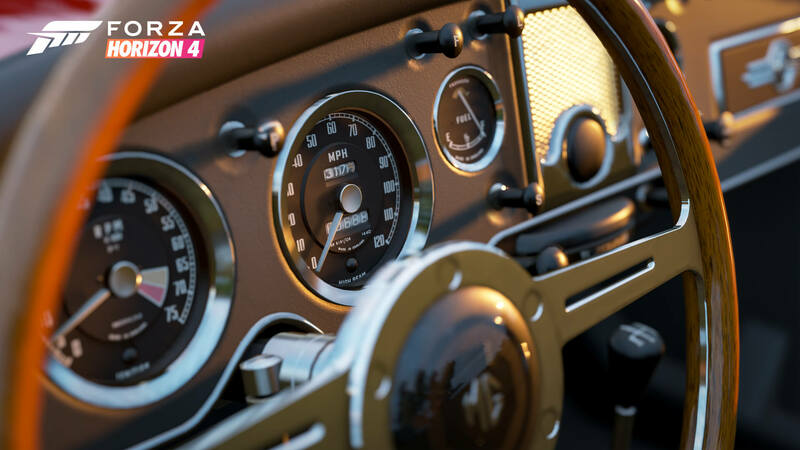 Players will also collect more than 450 Forzavista cars in Forza Horizon 4 from over 100 licensed manufacturers, with both the temperature and weather conditions playing a significant effect on the handling and grip of each vehicle. Playground Games is promising this to be “the largest and most diverse Horizon car roster yet,” complimented by all the same customization options already adored by players, as well as some brand-new ones. These include Drift Suspension upgrades, and outside of cars, there's even driver personalization with all-new character clothing options, with accessories and emotes to bring your driver to life and make them unique to represent you. You’ll choose from the same line-up of characters present in Forza Horizon 3, but this time, you’ll personalize them with around 500 apparel choices designed to work across both genders, with 50 emotes that can be used at key moments in the game, with one example being after you win a race. There's all different kinds of properties and businesses you can acquire in Forza Horizon 4. Plus, for the first time in the Forza franchise, players can purchase their own property that unlocks “new items and gameplay perks.” You’ll be able to park your car outside houses and examine it in the Forzavista mode. These properties range from a little cottage in the Cotswolds to the extravagant Edinburgh Castle. There’s also Horizon-style jobs you can complete in Horizon Stories, including one for being a stunt driver on an automotive magazine show. These jobs are offered to you by colourful characters and come with a host of bespoke driving opportunities. Businesses can also be acquired in Forza Horizon 4, including a taxi firm that rewards players for using a classic Austin FX4 London Taxi to get people to where they need to be. Because Forza Horizon 4 encompasses all four seasons, the Horizon Festival is no longer just a Summer gig, but rather a 365-day ‘Horizon Life’ experience. Bluebells and snowdrops cover the woodlands and forests in Spring. Players can also experience Forza Horizon 4 alone, cooperatively with friends, or in online multiplayer, which includes both casual fun racing and ranked team events. With a shared open-world experience that can feature up to 72 players at once, replacing the AI-powered Drivatar system of previous games, Forza Horizon 4 will be the most social racing game yet. Combined with the return of Campaign Co-op and special new 'Forzathon Live' events that offer random challenges to players to complete together, there’s a bunch of unique ways to enjoy Forza Horizon 4 with the wider online community. Forza Horizon 4 also includes “integrated Mixer broadcasting and spectating features” to add to its social experience, and players can unlock additional rewards in-game by simply livestreaming the game and engaging an audience. Seasons also unlock new themed content, gameplay, challenges and rewards to make an expansive experience that changes every week as you discover lakes, valleys, castles, and breath-taking scenery all in native 4K and HDR on Xbox One X and Windows 10 PCs. This is historic Britain like you’ve never seen it before – from the Welsh Valleys and the Scottish capital of Edinburgh to England’s best driving roads, villages, lakes, and scenes. There’s an even an off-road adventure park and those tiny little cottages to buy in Cotswolds. In addition, Britain in Forza Horizon 4 will approximately be the same size as Forza Horizon 3’s depiction of Australia, but with the all-new dynamic seasons, it will feel like a completely different world and landscape to explore every week. Available now for pre-order, Forza Horizon 4 launches worldwide on October 2nd for Xbox One and Windows 10 PCs as an Xbox Play Anywhere title – available day in date on Xbox Game Pass. 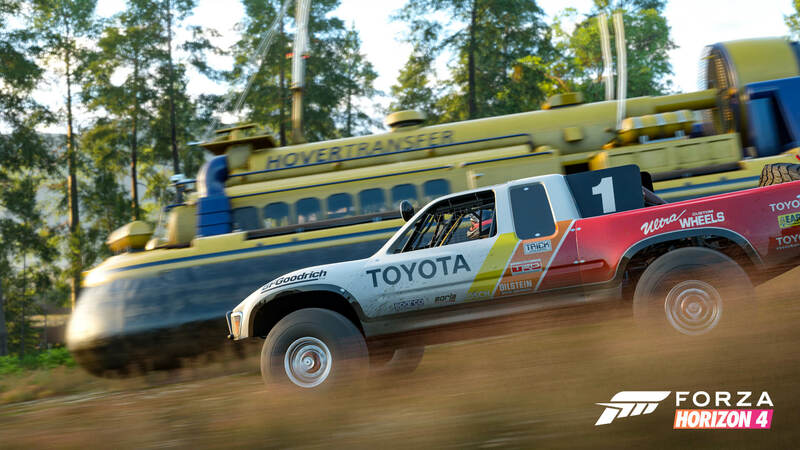 Deluxe and Ultimate Editions have also been confirmed, with the former offering the base game, the Formula Drift Car Pack and Forza Horizon 4 Car Pass, whilst the latter also includes early access to the game on September 28th, an unspecified ‘Day One Car Pack,’ two full-fledged expansions, and the usual VIP Membership. For more insight into Forza Horizon 4's dynamic seasons and how they create a sense of a living world with progression, check out IGN's exclusive coverage. There's a bunch of quotes from the team at Playground Games with fascinating details on the development of the game.